This week I've launched a new blog, a new experiment. For a few months now I've been trying to put my thoughts and ideas (and in other words, grumbles) on the existing state of the economy on paper as a kind of "manifest": why these things seem to happen in deepening cycles and how/why there has to be another way in business, life, community and society. Like I said, a kind of manifest. To cut a long story short: none of my trial versions passed muster in my own eyes. Too much to tell, explain, show a different way. I failed to put all of it into a comprehensive - and readable - paper. It would come out as gobbledygook, and no one would have a clue what it was all about I'm trying to tell. I'd almost given up on the idea, because if something is worth doing, it's worth doing well - and I was not getting anywhere doing it even half decent. For many years I have this story in my head I always thought I would write down some day (when I'm old and retired?). 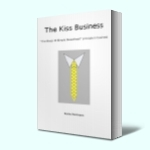 The story is not another business novel like my first ever paperback publication (of which this blog is a spin-off): "The Kiss Business, the Keep It Simple Sweetheart principle in business". No, this time it' going to be a different genre, one I've always been a great fan of, even since childhood: science fiction. Why not combine the two? The outline of the SF story has been in my head for years now, but not (yet) set in stone, just the general gist of which characters and which adventures they would encounter. I don't know if you've ever written a book or long story, but my experience is that the story seems to develop itself further and firmer once you start the actual writing. And often the story takes a surprising turn through a specific - unplanned - sentence. It twists, turns, rolls around in the head and on paper. Adding an extra "ingredient" in my SF story is therefore quite easy and a new idea was born. For years I have a title in my head: "Jumpers" - the actual story will explain why this title. I've now added a sub-title to it: Jumpers - a manifest. Writing a story, specially one with an extended purpose, is quite good fun. Side paths can be taken, flash backs used to introduce the history of various characters, two way discussions inserted to explain how and why the characters are worried, excited, doing the things they do etc. A very different method than just writing a "white-paper". So, how about following this very process yourself? If, of course, you're at all interested in this. But if you are, you can follow the development of the story, the characters and the adventure on my brand new blog: Jumpers - a manifest, where draft chapter by draft chapter will be published (and edited if and when needed). The first draft chapter went up yesterday, then I discovered I should have called it chapter 1.0, because a first twist already appeared and turned into chapter 1.1 (not published yet). I can't promise how regular the drafts will be published or how often an edited chapter will replace a draft. You can subscribe to receive an email alert when new material has been published and by all means: leave your comments, thoughts in the comment box of the new blog. I'm sure I'll be having a great time - and once in a while a bad time - writing my "manifest" with a twist. Come and join the adventures of my characters. I promise there will be some radical business ideas strewn in for good measure! This week's episode of Britain's Next Big Thing brought new developments for some contributors and more insight into the sometimes strange world of big retailers (and business sense of some). It really seems there's a big difference between how the three participating retailers work with their brand new - or soon to be, and for some hopefully soon to be but still unsure - designers and suppliers. Besides Catherine Gray (of the ceramic brightly coloured vases) it now also became clear that Laura Wellington's Hula would be licensed to Habitat in a dressed down version of only white plastic strips for the light instead of the multi-coloured strips. In one of the earlier posts on #bnbt (License to sell) showed that Catherine was happy to take around £900.00 for the pleasure, instead of a higher profit. In this week's episode she told Theo she realised now that in fact she was getting "paid" for high buzz exposure (my translation of what was said). The same is now happening with Laura. Both dress down their product to make it an unique item for Habitat, while staying in control over the other versions and where the big retailer takes the risk of the production and the sale of the "unique item". Both are being paid of the numbers produced, not on the numbers sold. Two other Habitat potential new suppliers (although if you check Habitat's online site you know who's made it) plan to supply the retailer with their own produced products. Take the Beeble - the best example in this case. Steven Biddulph started by asking £ 85.00 for his foot stool, Habitat is still expecting to pay no more than £ 30.00 per Beeble. So, Steven keeps tweaking his design - dressing down - to accommodate their demands. Contrary to the two ladies who take a royalty, will he be able to produce the normal Beeble once the product meets Habitat's purchase price? Where will he find reasons to ask "private" clients a higher price. The only way I can see is varying the cover fabrics, but would that make a sufficient "different" beeble? The Frog Brackit has made it into Habitat without being dressed down too much. Habitat only wanted a very small change in the frog it self and possible coloured ones (green and brown frogs were being tested during the episode, specially the green one I thought looked quite nice). Debbie Evershed stays firmly in control, and is in my opinion one of the winners of the program. Richard Weston traveled to Como to watch his exquisite scarves being produced next to products of well known brands. He's getting ready to supply Liberty with his scarves and keeps a close eye on the quality and quantity. Don't think so Richard. Think it is more down to the authenticity the Italian visit portrait. Looking forward to next week's episode, the last one in the series. Who will end up in the winner's team, who will fall at the last hurdle? (Of course, this program has been made way before the first episode was aired, keeping your ear - and eye - out on Twitter and Facebook or on the various contributor's websites gives you a decent guess already). This week's 4th episode of Britain's Next Big Thing was often "interrupted" in our house due to lively discussion between me and my partner. Sure means it is an interesting program, but some items!!! Mr retail himself Theo Paphitis used boxes to explain how little profit a retailer ended up with, just a measly 5% if the buyers got it right. Dear of dear me. Poor retailer. 10% to storage, logistics, marketing and the wages for buyers and inhouse designers. Easily forgetting that the larger the retailer, the higher the total overheads are - the economy of large numbers. Besides, the 5% profit is more often than not for the shareholders, like Dragon's Den man Theo and his colleagues. So, does this really explain why the big high street retailers squeeze their suppliers that much and hard? Small, independent retailers work quite differently, lower mark up, lower overheads, higher % of nett profit - if they work smart. And establish a fair relationship with their suppliers at the same time. (Side-note: the VAT man does not take a part from your profit; every VAT registered business acts as a collector of the Value Added Tax, deducting any VAT they pay themselves from the VAT their clients pay. And why were the buyers and in-house designers of the poor retailer grouped in a different class than the floor staff when it comes to their wages/pay?). One of the contributors for Habitat is Catherine Gray with her ceramic vases, made in her own studio. She's selling them for as high as £ 195.00 a piece - giving her a £ 75.00 profit per vase, but Habitat is eager to sell them for £ 30.00 - wow. Problem there you would think, this retail price means the vases are made at a loss if Catherine produces every single one herself (her largest order to date has been 16 pieces) or... licensed by Catherine to habitat to have them mass produced in Italy. The mass produced vases (for which Catherine will receive £ 0.30 per vase) will differ from the unique, produced in the UK in her own studio for her private clients in order for both parties to do "their own thing" without competing with each other. Not much profit in there you think? Well, that depends how you look at it. Catherine has no costs, liability or risk to take with licensing her "habitat" vase, but receives £ 0.30 royalty per Habitat vase, plus - as she states herself - being recognised as an official Habitat desginer comes with its own kudos: almost free marketing for her other, more personal, bespoke vases. Which she can produce and sell for as much as her private clients are willing to pay for. Deal. If you saw Charlotte Sale struggling to get the order out for Liberty you might wonder why she doesn't go the same way and license one - or more - products the same way, stopping the risk of making the unique glass pieces without a profit (due to the number of "faulty" ones). However, Liberty is quite a different beast than Habitat, with only one store (a very prestigious one at that) and giving their suppliers a fair deal. This was also confirmed by Richard Weston, the professor of architecture and creator of colourful and amazing scarves with blown-up prints of minerals. Both new Liberty suppliers stay producers, in control of production with its own risks, which does come with larger profits. The retailer in BNBT with the most outlets, which prompted Theo to give us some more pointers on the economy of large numbers when getting your product into one of the High street "giants". The other two could sell 100 of your product for £100.00 - netting £ 10.000 turnover (the retailers, not you), where as Boots could sell 250.000 of your £ 1.00 products - netting £ 250.000 turnover (Boots, not you). The older teenagers didn't like the packaging, would pay no more than £ 2 - £ 3 for it, not the £ 6.00 Elaine Weston had set. The packaging, according to Boots teenager didn't make it look professional or trustworthy enough to do what it said on the tin. Boots buyers' comment to Elaine after the test with the teenagers was completed: you'll have to find cheaper ingredients, they are not willing to pay the price for it you want. Eh? It's the packaging stupid, not the ingredients! Fortunately Elaine refused to change her ingredients to comply with Boots request. Not sure if Boots mentioned the real reason this - none-target - group was not willing to pay more for it, otherwise a completely different discussion would have taken place: are you willing to change the marketing, the labeling to make it more attractive to this group? Looking forward to the next episode of #BNBT, more and more convinced some of the contributors will make a very good deal (while keeping in control) and others will, I'm afraid, not see beyond the kudos of getting that foot in the door. As for the E-guide "Selling Online Basics - SO-basic: being a small independent retailer (lower mark-up, lower overheads, higher % of nett profit) with all the tasks that come with it - all joyfully excecuted every day - does limit the "free" time I can spend on it at the moment, but the end is near. So, stay tuned (for BNBT and more news on the E-guide). UPDATE 19.05.11: "Selling Online Basics" officially launched! BNBT update - for sale! After my wonderings (why so many seem to be so eager to get a foot in the door at large retailers) of the last two weeks on Britain's Next Big Thing, an update on various contributors to the program. Although there is economy in large numbers (sold through big retailers), never forget the "economy of profit in smaller numbers"
Straight from the designer's own online website, and priced according his own expressed wishes during BNBT #3 (normally £ 200.00 - now with 25% off, but with the profit in smaller numbers). Always love to see these statistics on Amazon.co.uk - puts paid to the myth that everyone always makes their buying decision based on price alone. The Frog Kit is for sale in the Habitat online shop, but rather confusingly the bars and hooks can't seem to be found straight from the essential product. Frog Bracket or Frog BracKit gives the same 0 result. Not a very user friendly experience I must say. It's like hiding the "latest product with a buzz" deep at the back of the store. Although, her website could do with some better SEO too - again the page titles are missing, what's so difficult for a web designer - Vosweb - to do this little simple thingy? The three big retailers are attractive for suppliers/designers to sell (hoping to sell) larger numbers of their products. BNBT gives them a higher profile, and I sincerely hope their own websites and online selling takes off or improves as a result. My fear with new buzz products is always: how long are they the Next Big Thing at these big retailers? And then what? The websites I've seen today could all do with improvement though - even the Habitat one, but that's not my objective - from the most simple SEO Meta tags to simpler and cheaper shopping carts. Upwards and onwards with my guide, it's great fun and exciting at the same time bringing 4 free (plus 1 "pay-when-you-sell") online software programs together to help small businesses with the "economy of profit in smaller numbers". This week's episode showed 10 hopefuls venturing in to Boots HQ. The one that amazed me most, just by one single revelation, was Tracy Wood, producing eczema ointment in her own kitchen in New Haven. During a quick take showing Theo and Tracy she revealed she was already selling the product, due to existing clients recommending her product to others. "I've must have sold around 70.000+ jars from my own kitchen already." Holy-smoke, that's a big buzz - even Theo was impressed. I understand the image of having your own product on the shelves of one of Britain's biggest health and beauty care retailers gives - and at this point in the series it is still not known if Tracy will succeed in this - but 70.000+ sold already without any noticeable branding is IMHO quite an achievement. (Looking at Tracy's website, which loads terrible slow and is kind of off-kilter I don't think this site generates many new contacts - Quirk SearchStatus only shows back links from her own domain and a single one from 123people, Google doesn't list a single link coming in. Her Facebook page has 2 posts and 30 members and I guess she just started on Twitter, first tweet of the 26 in total was 16.03.11, so hardly any Social Media presence at the moment). Quantity in products or quality in profit? So even without a decent web presence her natural products have created such a buzz among her clients, she's managed to sell 70.000+ single items. Of course, this on its own does not make a new product Britain's' Next Big Thing - having 100 units of your product in every Boots shop would mean you have to at least produce 200.000 units. And of course there's economics in producing big quantities but how about the quality in profit on those same 200.000 units? My - and I think anyone's - guess is that Boots would take the biggest profit from it. Tracy is only one of the many persons working from a small unit - kitchen, workshop, bedroom - nowadays. And not many will make it "on to the shelves" of Britain's biggest retailers. But in these days of the long tail, easy internet access and free software programs to help you market and sell your products online I'm wondering why many would still opt for increased quantities versus reduced profits in absurd large numbers of units? There's a lot of people out there with great products that could do with a simple but effective step by step guide showing them how to keep the full profit in their own pocket. When we moved home last June we closed the showroom on Sundays - before we only had to cross the road, now it is a 10 minute drive. Thinking I would find more time to write on these now leisure days - even wrote about it here - things turned out differently, even after the weather turned and no more Sundays spent in the sunny garden or on walks (to the local pub - a walk of 25 minutes on its own). On dark and wet Sundays of late I did write, but not as presumed for this blog. Marketing projects and ideas for our business took prevalence over general ponderings on business. Plus I rekindled my baking hobby! There are Sundays the only thing that enter my head is the lovely sweet smell of fresh muffins or biscuits (the Dutch spiced biscuits spekulaas as current favourite). second book by 37Signal owners Jason Fried and David Heinemeier Hansson. Bite-size snippets of wisdom where almost none of the chapters is longer than 1.5 pages. And at the same tine showing/teaching you everything about being in business a MBA graduate adviser tells you not to do. If you want to start or grow/improve your business it is a must read, you will worry less and succeed sooner. How should you keep track of what customers want? Don't. Listen, but then forget what people said. Seriously. There's no need for a spreadsheet, database, or filing system. The requests that really matter are the ones you'll hear over and over. After a while you won't be able to forget them. Your customers will be your memory. They'll keep reminding you. They'll show you which things you truly need to worry about. If there's a request that you keep forgetting, that's a sign that it isn't very important. The really important stuff doesn't go away. Another gem of advise can be found in Building to flip is building to flop (page 59): you need a commitment strategy, not an exit strategy. Some books should b e compulsory reading, when we opened a business account with Barclay we received Kick-Start Your Business: 100 Days to a Leaner, Fitter Organisation (Virgin Business Guides) by Robert Craven. Where Robert's book gives you plenty of practicalbusiness advise on starting/running your business, Rework should be added to any new business account opening package for the sake of business attitude and long term strategy. Go on, you know you want to read this, if it is only to fulfill your curiosity to find out what's behind the chapter tittles. And curiosity is a great characteristic to have as business person.